Samsung confirmed in 2017 that it will be supplying its Exynos chips to Audi for use in its infotainment systems. It joined the Audi Progressive SemiConductor Program as a supplier in 2017. Samsung has since been supplying the Exynos-branded chips to the German auto giant. It later decided to establish a separate brand called Exynos Auto for these chips. Samsung has launched its first auto-branded Exynos processor today. The Exynos Auto V9 will be used in Audi’s next-generation in-vehicle infotainment system which is expected to debut in 2021. “We are thrilled to introduce the new Exynos Auto line of products, starting with the Exynos Auto V9, which brings powerful processing performance to the next generation of automotive in-vehicle infotainment systems while meeting the industry’s strict reliability requirements,” said Kenny Han, VP of Samsung’s device solutions division. 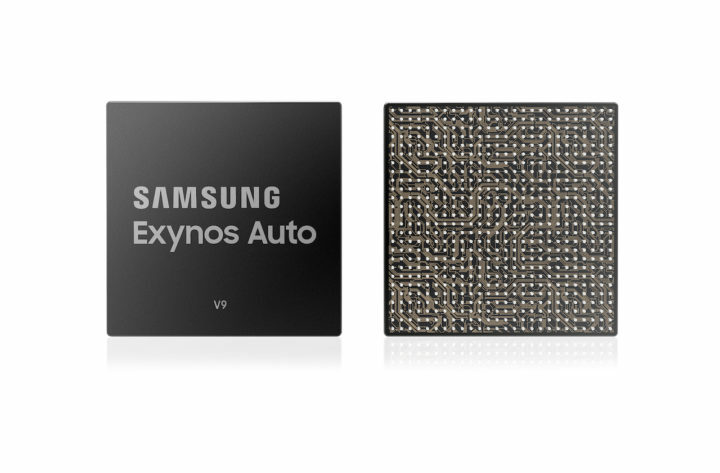 The Exynos Auto V9 has been designed for advanced infotainment systems. It will allow for content to be displayed on multiple screens for a safer and more enjoyable experience. The chip itself is based on the 8nm process technology and features ARM’s latest Cortex-A76 CPU cores, 8 to be precise, at up to 2.1 gigahertz. They’re coupled with ARM Mali G76 GPU, premium HiFi 4 audio digital signal processor and an intelligent neural processing unit. There’s also a safety island core with support for Automotive Safety Integrity Level (ASIL)-B standards. The Exynos Auto V9 has support for LPDDR4 and LPDDR5 DRAM. The Exynos Auto V9 has support for up to six displays and twelve camera connections for multiple sub-systems. Its GPU is arranged in three separate dedicated sets of Mali G76 GPU cores to seamlessly power multiple systems like the central information display, cluster display and rear-seat entertainment. Samsung may also supply this chip to other car manufacturers if it wins over any of them. Cars are increasingly becoming more connected and there’s a need for more computing power. Samsung’s Exynos Auto V9 seems to fit the bill. Will this run Doom ? But I don’t like the touchscreen in car. Physical button are better. For touch screen you need to look on it to find what you want. This can cause accident. With physical button I not need to look on it to change something. I can do it with always looking on the road. Yeah, I agree, touchscreens are a liability, but even air conditioning buttons are becoming touch buttons now, car companies don’t care for safety as much as they do for fancy features, although I guess that’s because the consumers want fancy features. Same goes for using navigation on the infotainment if it’s placed below the dashboard, which is often the case in regular cards (premium ones usually have the display sticking out above the dashboard, which is less problematic as it doesn’t take away as much of your eyes off the road). You are right. But this is not problem for me because I’m driving old Golf 4 from 2000. As you said about touchscreens, know the D3 and D4 A8? Those had their MMI screens way up in the dash and were operated by the MMI rotary dial. The new D5 has touchscreen-only MMI, LOW in the dash. It’s as backwards as the S8 was with the infinity display, but it’s even dangerous because it’s in a automobile and you can’t always trust lane keep assist etc. It’s also why I was never fond of controlling my TV with my phone with an IR sensor. Physical buttons become muscle memory while you will always have to look at a phone’s display to operate the TV using an IR sensor. With smart TV we can operate the TV using bt and smart things app. But like you I still prefer traditional remote pilot. However it is sometimes useful to turn off TV while I am in another room. I hate touchscreens both in car and those useless virtual buttons from Galaxy S8 onwards. So, my S7 is the equivalent to the D4 generation Audi A8, as the physical buttons are equivalent of the MMI rotary dial on the center console. What car are you driving now ?